Staining of human peripheral blood granulocytes with Mouse anti Human BLTR:FITC (MCA2108F). Staining of human peripheral blood granulocytes with Mouse anti Human BLTR:Alexa Fluor® 647 (MCA2108A647). Staining of human peripheral blood granulocytes with Mouse anti Human BLTR:RPE (MCA2108PE). Staining of human peripheral blood monocytes with Mouse anti Human BLTR (MCA2108GA). Staining of human peripheral blood monocytes with preservative free Mouse anti Human BLTR (MCA2108XZ). Mouse anti Human BLTR antibody, clone 202/7B1 (MCA2108) used for the detection of Leukotriene B4 receptor 1 expressing cultured peripheral blood mononuclear cells by immunofluorescence. Leukotriene B4 biosynthetic enzymes and receptors are expressed in both macrophages and osteoclasts. (a) Quantification of leukotriene B4 (LTB4) levels by enzyme-linked immunoassay in the conditioned medium of human peripheral blood mononuclear cells (PBMCs) treated with 25 ng/ml macrophage colony-stimulating factor (M-CSF) and 10 ng/ml interleukin 23 (IL-23) for 3 days. Representative data from three experiments are shown. **P < 0.01. (b) Immunofluorescence of human PBMCs cultured with either M-CSF alone for 8 days or M-CSF + receptor activator of nuclear factor κB ligand (RANKL) for 14 days showing the expression of BLT1, BLT2, 5-lipoxygenase (5-LO) and leukotriene A4 hydrolase (LTA4H) in mononuclear and multinucleated giant cells. Representative images from three experiments are shown. 4′,6-diamidino-2-phenylindole (DAPI) is blue and BLT1, BLT2, 5-LO and LTA4H are in red. The scale bars represent 20 μm in Figure 1b. From:Dixit N, Wu DJ, Belgacem YH, Borodinsky LN, Gershwin M, Adamopoulos IE. Leukotriene B4 activates intracellular calcium and augments human osteoclastogenesis. Arthritis Res Ther. 2014 Dec 2;16(6):496. BLTR is expressed by peripheral blood granulocytes and is important in the pro-inflammatory response. HeLa cell transfectants expressing human BLTR. Where this antibody has not been tested for use in a particular technique this does not necessarily exclude its use in such procedures. Suggested working dilutions are given as a guide only. It is recommended that the user titrates the antibody for use in their own system using appropriate negative/positiv controls. Where this antibody has not been tested for use in a particular technique this does not necessarily exclude its use in such procedures. It is recommended that the user titrates the antibody for use in their own system using appropriate negative/positive control. Pettersson, A. et al. (2000) First-generation monoclonal antibodies identifying the human leukotriene B(4) receptor-1. Biochem Biophys Res Commun. 279 (2): 520-5. Costa, M.F. et al. (2010) Leukotriene B4 mediates gammadelta T lymphocyte migration in response to diverse stimuli. J Leukoc Biol. 87: 323-32. Islam, S.A. et al. (2006) The leukotriene B4 lipid chemoattractant receptor BLT1 defines antigen-primed T cells in humans. Medoff, B.D. et al. (2005) BLT1-mediated T cell trafficking is critical for rejection and obliterative bronchiolitis after lung transplantation. J Exp Med. 202: 97-110. Serezani, C.H. et al. (2009) FcgammaRI ligation leads to a complex with BLT1 in lipid rafts that enhances rat lung macrophage antimicrobial functions. Heller, E.A. et al. (2005) Inhibition of atherogenesis in BLT1-deficient mice reveals a role for LTB4 and BLT1 in smooth muscle cell recruitment. Thomas, S.Y. et al. (2007) Multiple chemokine receptors, including CCR6 and CXCR3, regulate antigen-induced T cell homing to the human asthmatic airway. Sabirsh, A. et al. (2005) Fluorescent leukotriene B4: potential applications. J Lipid Res. 46: 1339-46. Loell, I. et al. (2012) Activated LTB4 pathway in muscle tissue of patients with polymyositis or dermatomyositis. Ann Rheum Dis. 72: 293-9. Wang, L. et al. (2012) BLT1-Dependent Alveolar Recruitment of CD4+CD25+ Foxp3+ Regulatory T Cells is Important for Resolution of Acute Lung Injury. Am J Respir Crit Care Med.186: 989-98. Laarman, A.J. et al. (2012) Staphylococcus aureus Staphopain A inhibits CXCR2-dependent neutrophil activation and chemotaxis. Dixit, N. et al. 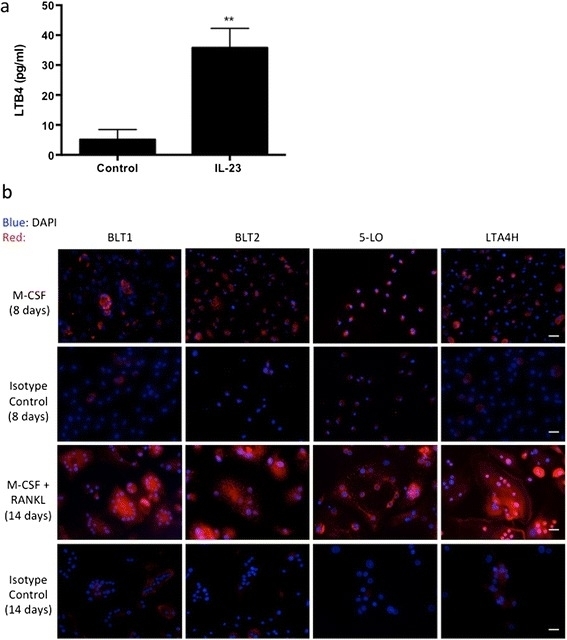 (2014) Leukotriene B4 activates intracellular calcium and augments human osteoclastogenesis. Arthritis Res Ther. 16: 496.